Sometimes, “a ton of chocolate” isn’t hyperbole. 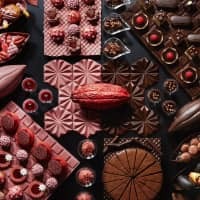 Running now until Dec. 26, ANA InterContinental Tokyo proudly presents Chocolate Sensation, a hotel-wide event celebrating cocoa-based culinary creativity; and to make sure there’s enough to go around, the hotel has procured multiple chocolate shipments that together weigh a whopping 4,500 kilograms. Spread out between 10 of the hotel’s restaurants and bars, the event features 220 unique creations ranging from chocolate mojitos to cacao-marinated Angus beef tenderloin and every imaginable dessert in between. Many of these delectables use ruby chocolate, the latest and oft-talked-about addition to the chocolate family characterized by its natural pink color and berry-like tang. Highlighting the event is the Ruby Chocolate Afternoon Tea special, available daily at the second-floor Atrium Lounge. 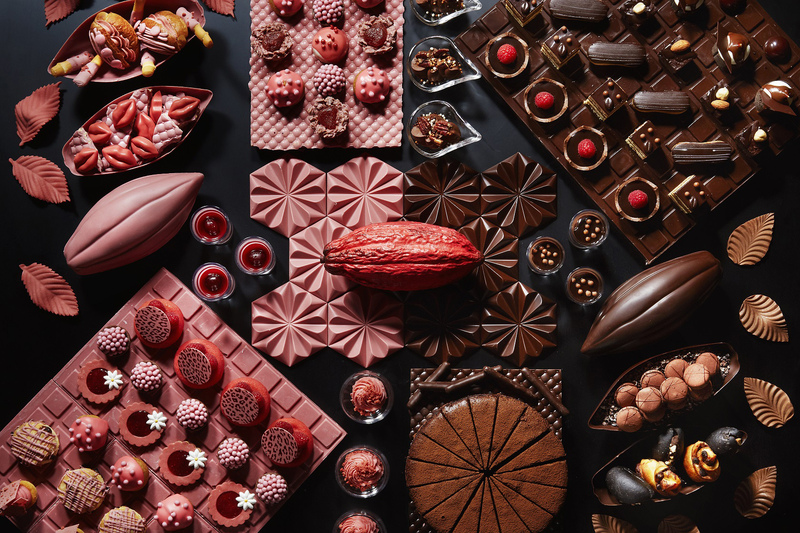 For just ¥6,400, guests will be treated to 11 varieties of petit gateau (all of which contain ruby chocolate), five savory sides and their choice of 22 different teas and coffees. Additionally, starting Nov. 1, the second-floor main lobby will host a variety of chocolatey attractions, including six pop-up chocolate stores, various exhibits of artwork and photography by successful chocolatiers and a series of 30 confectionery workshops. The ANA InterContinental Tokyo is one minute from Tameike-Sanno Station Exit 13. For more information or reservations, visit anaintercontinental-tokyo.jp or call 03-3505-1185. 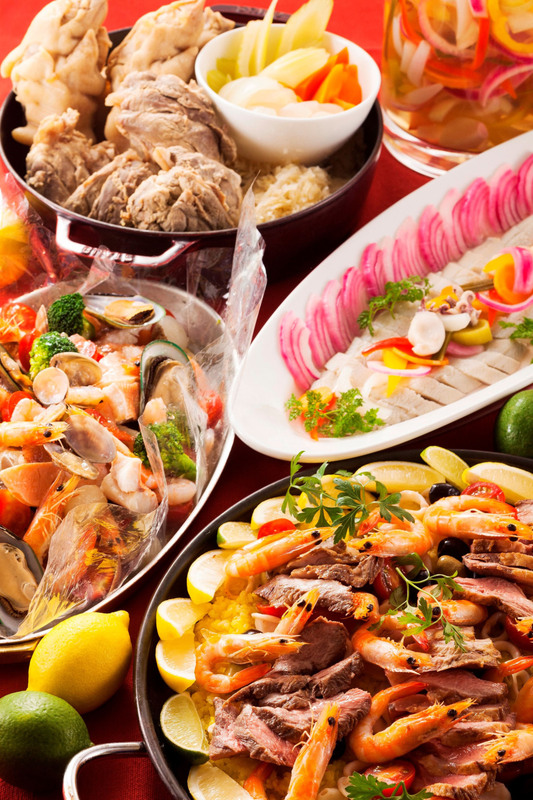 The Yokohama Royal Park Hotel is turning 25 — right about time to indulge in a grand feast. Available now until Nov. 30, the hotel’s 70th-floor Sky Lounge Sirius is celebrating by hosting an original 25th Anniversary World Culinary Fair. Every day from 11:30 a.m. to 2:30 p.m. (last order), visitors to the sky lounge can delight in tasting a variety of international cuisine for only ¥4,276 (price reduced for seniors and children). The lunchtime menu offers both chilled and hot dishes prepared buffet-style by chefs well-versed in world culinary techniques. The menu includes a Spanish mussel and Iberico ham paella, Indonesian rendang cuisine comprising beef stewed in coconut milk, and a savory Peruvian potato dish known as causa de atun. There will also be a live kitchen serving luxurious creations from Mexico, the U.S., Portugal and Japan’s own Akita Prefecture. Guests attending on weekends and holidays will be treated to an exclusive dessert menu of bubble tea, hot brownie ice cream and a creamy chocolate fountain. And as icing on the cake, the glorious autumn views from the 277-meter-high lounge are sure to round off the meal pleasantly. The Yokohama Royal Park Hotel is located in the Yokohama Landmark Tower, three minutes from Minatomirai Station and five minutes from Sakuragicho Station. For more information or reservations, visit www.yrph.com or call 045-221-1111. An Arabian Night is falling on the Hilton Osaka. 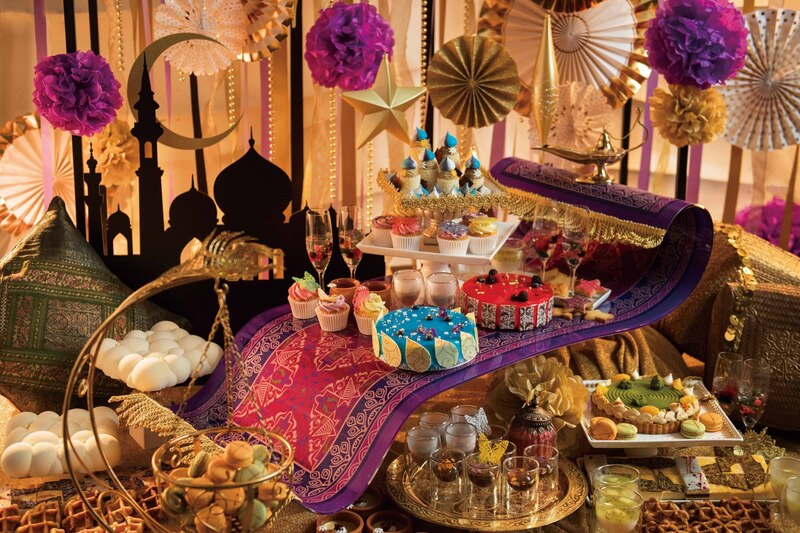 Through Dec. 24, the second-floor, all-day dining establishment Folk Kitchen is serving up its Magic Carpet Ride — an Aladdin-style dessert buffet that is guaranteed to please. The buffet is available daily from 3 p.m. to 4:30 p.m., starting at ¥3,900 for adults and ¥1,950 for children ages 4-11. Designed by pastry chef Toshiharu Hyakuda, each menu item is brimming with creativity, both in design and flavor. Particularly delightful is the Mont Blanc-style Desert Castle, made in the shape of a Persian palace using Swiss roll cakes and meringue toppings. The restaurant — which newly opened itself on Aug. 3 — is adorned with a plethora of attractive displays including magic lamps, Ali Baba’s treasure hoard and a beautifully woven carpet that looks as though it may fly off at any moment. In addition to sweets, the restaurant has also prepared themed savory dishes, such as its Thieves’ Curry that uses black rice and a rich, blood-colored roux. With Halloween just around the corner, the Folk Kitchen invites families to take advantage of this limited offer and spend a sweet, magic-filled moment together. The Hilton Osaka is two minutes from Osaka Station. For more information or reservations, visit www.hilton.co.jp/osaka or call 06- 6347-7111.